Forklifts are an essential component of every factory floor and many businesses simply could not get the daily job done without a forklift. Due to the importance of forklifts, if you need one transported as a result of a recent purchase or even a business relocation then you’re going to want to find a transport company who arrives on time, is reliable and who will handle your forklift freight with care. Some forklifts can be small but there are container handler and large forklifts that get really big and, therefore, if you need one of these moved then you will need to find a transporter who is experienced with carrying this type of larger machinery freight. Smaller forklifts will also require a carrier who is skilled at forklift transport. Find a forklift transport company operating in your pickup and delivery areas, both locally and interstate and get quotes today! Get 3 Quotes for forklift transport. It’s free to request quotes. Large Forklift: Forklifts come in a range of sizes and some of the higher tonne lift capacity forklifts can be extremely large. It can be helpful to include in your freight quote request the lift capacity of your forklift. This is so that the transport companies contacting you to provide costs and rates for your large forklift freight have the correct sized vehicle that is equipped to carry larger machinery freight. The truckie will also require equipment such as loading ramps or a truck with a tilt tray trailer to load a large forklift for transport. Walkie Stacker Forklift: If you need a walkie stacker forklift moved from one factory to another then you need to find a reliable forklift transport company to move that for you. ABN verified forklift transporters are available who are reputable and experienced in handling walkie stacker forklifts and operate throughout Australia including all capital cities such as Melbourne, Canberra, Adelaide and Perth. Small Forklifts: Most commonly moved due to factory relocations or recent purchases, small forklift transport is often required and these forklifts are transported all across Australia, mostly moved locally. A small forklift can be loaded onto the back of the truck or truck’s trailer using a loading ramp and are easily driven up the loading ramp ready for transit. You will need to find a forklift transport company who has the right truck, trailer and equipment to carry your specific small forklift freight or multiple small forklifts, as required. Electric Forklift: Have an electric forklift and need it relocated anywhere across Australia? You can find professional forklift transporters to move your electric forklift interstate, as well as through regional or metropolitan areas. Dedicated electric forklift transporters operate and are available throughout Victoria, NSW, ACT and SA to move your electric forklift wherever you need it to go both locally and interstate. Stock Picker Forklift: Simply include the pickup and delivery locations of your stock picker forklift to find carriers across Australia. Enter the dimensions and weight of your stock picker forklift to ensure you’re receiving quotes from forklift transport companies with the correct truck or trailer to carry your sized forklift. Reach Stacker Forklift: If you don’t know the dimensions of your reach stacker forklift, then you can refer to the trade plate on your forklift. The lift capacity gives an indication of how heavy and large a reach stacker forklift will be as well. All this will play a part in determining which forklift transport company is able to shift the load. Container Handler Forklift: A container handler forklift is a heavy duty forklift designed to lift and load shipping containers for relocation and for transport. Sometimes when they are not shifting shipping containers these container handler forklifts require transport themselves. As these forklifts have large wheels, they are easily driven onto a truck or trailer for transport. 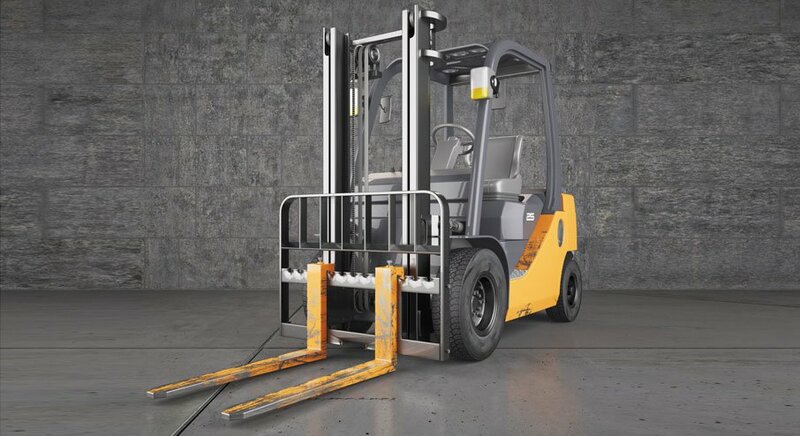 Loading ramps or a tilt tray can be used to load and unload the container handler forklift and the weight and size of this type of forklift means a specialised machinery transport company may be required. Forklift Jib: A forklift jib is a heavy piece of equipment and can be extremely big when designed to be used in conjunction with a large forklift. As the forklift jib is stationary, it changes the way the jib can be loaded onto the back of a truck. To carry a forklift jib, you’ll need to find a reliable and experienced equipment transporter anywhere across and throughout Australia in all states, including WA, NSW and QLD. Forklift Mast: There comes a time when just the forklift mast needs to be moved and in this instance you’ll need to find a reliable transport company with experience in moving stationary forklift freight. If you need a forklift container handler mast shifted then this can be a big operation for this type of heavy piece of equipment. Forklift Tynes: For a large forklift, the forklift tynes can be extremely large and very long. If you need forklift tynes relocated, then it’s time to get out your measuring tape because it will be highly beneficial to have the dimensions of your tynes to ensure you find the right truckies with the correct sized trailers to fit your particular forklift tynes quoting on your freight. Forklift Mast & Tynes: If you need the mast and tynes only of a forklift, large or small, relocated across Australia, then you need to find a reliable transport company to shift that load for you. Whether you need the mast and tynes transported interstate, through regional areas or just within metropolitan areas, you can find a dedicated forklift mast and tynes carrier. Whether you need a large forklift, reach stacker or container handler forklift relocated anywhere across Australia, including within metropolitan areas, regionally or interstate, then you need a reliable transport company to complete the job for you. FreightQuotes connects individuals and businesses with freight requirements to forklift transporters operating throughout Australia. Submit your free freight quote request online and this will be sent to all the forklift carriers registered with the FreightQuotes website. Three of these forklift transport companies who have the right vehicle and equipment to carry your forklift freight will then contact you directly with quotes and costs. Simple, convenient and no obligation to hire. Forklift transport is available Australia wide. This includes interstate, regional and metropolitan forklift freight covering all states and capital cities including Adelaide, Brisbane, Perth, Darwin, Melbourne, Canberra, Hobart and Sydney. You can also find heavy machinery, heavy haulage and heavy equipment transportation by filling out the Get Quotes form.